Free download PC Cleaner Pro and Lite latest version. It is all in one system security and speed up tool which protects your computer by performing several tasks. These tasks are performed after scanning your computer and scans items such as System Problems, Malware, Security Defense, PC Optimizer, Privacy Cleaner, System Performance and Junk Files/Clutter. System Problems scanning and fixing it enables your system to boost performance by fixing registry errors, obsolete shortcuts and file extensions. Malware feature ensures security of your PC by cleaning viruses, spyware and adware. Security Defense blocks harmful ActiveX, Spyware, Adware and Fix Windows Vulnerability issues to prevent security holes in your PC. PC Optimizer is a newly added feature which analyzes and tweaks your system for maximum performance. Increases PC speed and boost web browsing speed. Privacy Cleaner cleans your all private data such as saved login and password. In this way, it protects your privacy by deleting sensitive and confidential information and surfing traces. 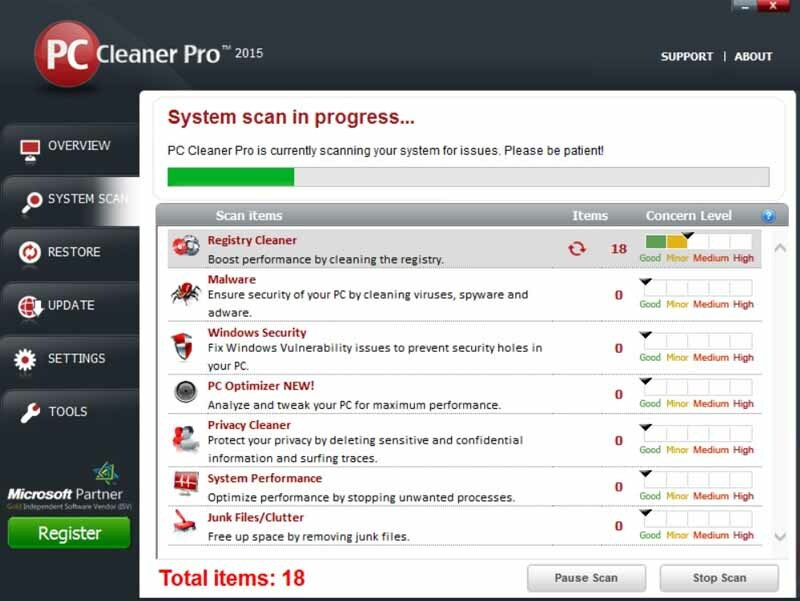 PC Cleaner Pro helps your PC to optimize performance by stopping unnecessary and unwanted processes. Junk Files/Clutter saves your system resources by stopping to load unnecessary application and improves application load time and search speed by removing useless clutter.